As the school year winds down, it’s time to start considering which summer daycare program is right for you — and most importantly, which program is right for your child. At Kidstown Learning Center, a top-rated kids daycare in Lake Worth, we believe that there are many benefits of summer daycare for kids — from interacting with their friends on a daily basis to thriving in a structured setting. But how do you know which summer daycare is the right one? 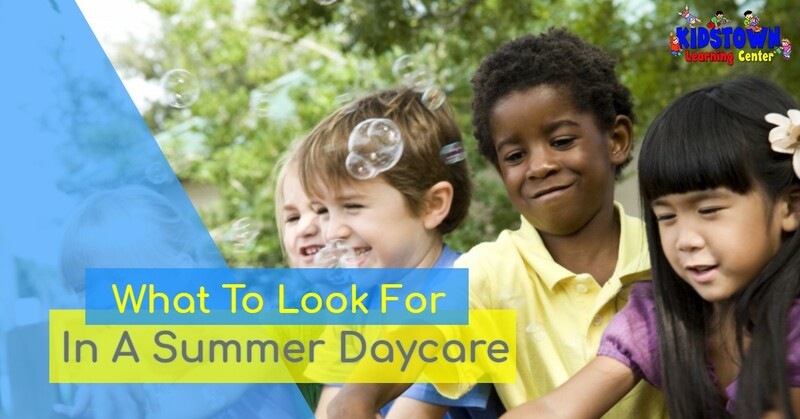 In this blog, we’ll help you decide by pointing out some things to look for in a summer daycare program. From how they present themselves to how open they are to accommodating you and your child, these are just a few of the top things to consider when choosing a summer program. Interested in learning more about our Lake Worth kids daycare summer program? Give us a call at 561-641-7555 today or contact us online. We are your child’s place to learn and grow! Before you drop off your child at just any old summer daycare or camp program, it’s important that you feel safe and confident in the facility itself. How does the outside look? Is it a nice, cool, refreshing escape from that dreaded Lake Worth summer heat? Are there toys, games, and decent classroom facilities? All of these are important factors to consider. This is where your child will be spending a good chunk of his or her summer, so it’s important that they also feel comfortable with the general vibe and atmosphere. Was the staff friendly upon meeting you for the first time? Did it seem like they wanted your child, or did it seem like they wanted your check? The right summer daycare will have welcoming, friendly, and professionally trained staff who are at the ready to help you and your child during the summer months. At Kidstown Learning Center, you can count on all of the above — and more. Our Lake Worth kids daycare is open and welcoming to all kids of all ages, and our staff is trained to care for them as if they were our own! We offer something for every child here at KLC. The last thing your child wants to do is spend the whole summer cooped up in a classroom. That’s why you should choose a summer daycare program that has much more to offer. From fun activities to day trips, water fights to afternoon movies, arts and crafts, to fun-filled games, Kidstown Learning Center offers it all. We fill our days with plenty of guided fun as well as free time for students at our Lake Worth kids daycare. There’s simply no better way for a child to spend the summer than by having fun and making lifelong friendships. Kidstown Learning Center is your child’s place to learn and grow — even during the summer months. Your child will learn to develop coordination, foster independence, and truly discover themselves! Learn more about our summer daycare in Lake Worth and contact KLC today to sign up today.